The Mercury Music Prize nominations were unveiled earlier this week to their usual debate-generating reception. Back in 2005, I was willing on The Go! Team to win the award with their innovative debut record, 'Thunder, Lightning, Strike' and I was particularly disappointed when Anthony And The Johnsons came out on top. Six years later, The Go! 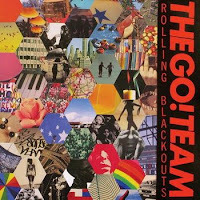 Team released their third album 'Rolling Blackouts' and we have a magical remix of one of the album's tracks downloadable below. The Chad Valley remix removes the bombast of the original, instead swirling into synth-led dream-pop. With Bethany Cosentino guesting on vocals, it sounds just as good as anything that Best Coast would do - even though it's much less fuzzy and guitar-centric than any of their material. Go on, brighten your day. Purchase 'Rolling Blackouts' at Amazon.co.uk, iTunes etc.